Is there an operative sponge left in the device pocket? The following PA and Lateral CXR was obtained the day after an uneventful dual chamber pacemaker implantation placed via left cephalic cutdown. One can see a radiopaque ribbon near the pacemaker can in both views raising the suspicion of a retained operative sponge. All skin dressings were removed and repeat CXR was performed. Repeat PA CXR performed after dressing removed leaving steri-strips in place reveals that wound dressing had inadvertently used a radiopaque lap sponge as part of a pressure dressing. Nice case of “pseudo” sponge in the pocket but certainly caused some initial stress during CXR reading! Esophageal Proximity can be monitored to guide locations of ablation to help minimize risk of esophageal damage. The entire length of esophagus that is contiguous with the left atrial posterior wall can be visualized with intra left atrial ICE to monitor ablation delivery and power titration. Figure 1A shows the typical location of the esophagus during an atrial fibrillation ablation. Ablation over the esophagus is avoided or power is titrated to minimize risk of esophageal damage. Endocardial thrombi or coagulum can be detected using radial ICE as shown in Figure 1B. Left atrial damage can also be monitored using radial ICE. Figure 1C shows an unusual case of a tear or rent in the endocardium discovered during an atrial fibrillation ablation. Finally, though radial ICE is not the ideal imaging modality to evaluate for pericardial effusions given its limited far-field resolution. Figure 1D shows the pericardial space in view when an intra-left ventricular ICE position is utilized. Radial ICE to Monitor for Intraprocedural Complications. Figure 1 Radial ICE to Monitor for Intraprocedural Complications. Image A shows the left pulmonary vestibule with catheter evident at 9 o’clock and the esophagus viewed obliquely at ~7 o’clock. 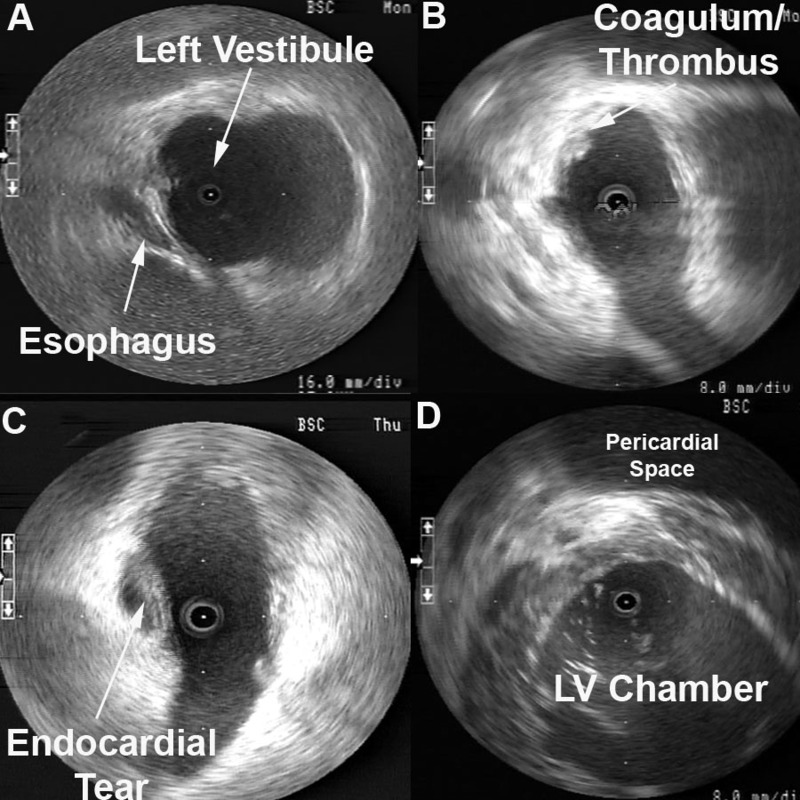 Image B shows a coagulum versus thrombus adherent to the endocardium. 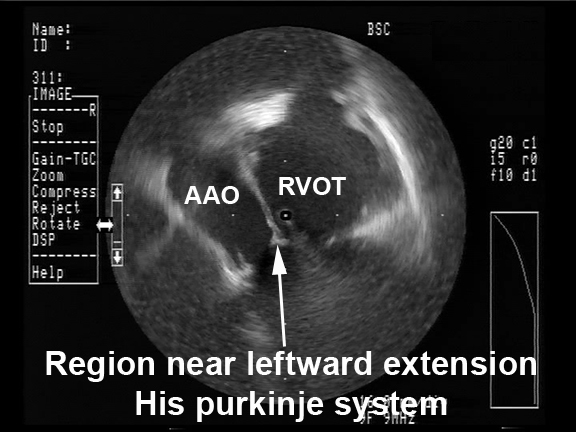 Image C shows a left atrial endocardial tear that did not result in pericardial effusion. Image D shows the pericardial space when ICE catheter positioned across the mitral annulus in the LV. 1 Ren JF, Lin D, Marchlinski FE, Callans DJ, Patel V. Esophageal imaging and strategies for avoiding injury during left atrial ablation for atrial fibrillation. Heart Rhythm. 2006;3: 1156-1161. Figure 1 Radial ICE Guidance of Transseptal Puncture for Left Atrial Access. The left and right atria are well-visualized with the ICE catheter in the right atrium along the interatrial septum in the fossa ovalis. One can see the tenting evident when transseptal needle is in good contact with the interatrial septum. Left Atrial Ablations can be enhanced and accomplished using intra left atrial radial ICE (with intraprocedural heparinization for ACT>300). [1,2,3] Radial ICE is a useful adjunct imaging technique for several reasons. First, direct visualization of the electrode-endocardial interface allows precise positioning of the ablation electrode to guide lesion formation. Second, radial ICE permits the delivery of “focal” left atrial ablative lesions; the electrode kept in same location throughout energy application by manipulating the ablation electrode into firm, stable endocardial contact during continuous ICE imaging of the electrode–endocardial interface. Third, the use of continuous radial ICE during atrial fibrillation ablations allows close monitoring of catheter position and endocardial contact while minimizing dependence on fluoroscopy. 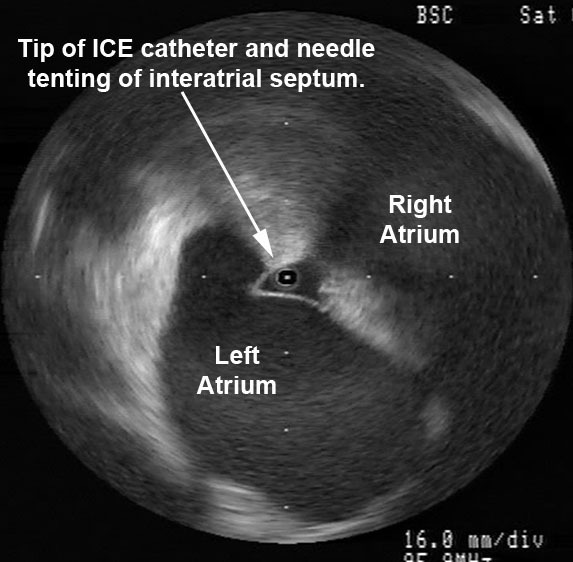 Figure 2 depicts a typical view obtained when radial ICE is positioned in the left atrium using a steerable sheath (Agilis, St. Jude Medical, Inc., St. Paul, MN). Radial ICE can also help guide linear ablation along the LA posterior wall for mitral annular flutter. Direct visualization of the left lower pulmonary vein, the posterior wall of the LA, the mitral annulus, and CS during ablation (both intra LA and CS) can improve catheter contact allowing for complete linear ablation and bidirectional block (see Figure 4). Figure 4 Ablation Near Mitral Annulus. 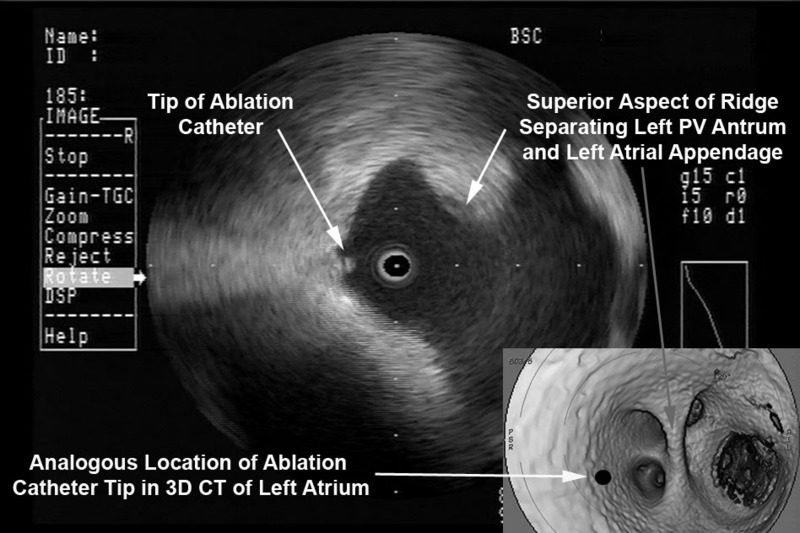 A depicts the intra-LA radial ICE catheter with ablation catheter along the floor of left atrium near mitral annulus. B shows a similar view demonstrating the ablation catheter in the CS. Endocardial (and CS) contact and possible ablation injury can be visualized during lesion delivery. Note: This is adapted from work I did with Dr. Sheetal Chandhok. Radial ICE (UltraICE™, Boston Scientific, Natick, MA, USA) uses a mechanical, 9 Fr, 9 MHz catheter, with 360° radial image. The ultrasound transducer rotates every 1.4° and with full mechanical rotation of the transducer (hence, 256 stacked lines of ultrasound data), a panoramic 360° image is created that is perpendicular to the catheter shaft at the tip. Radial ICE does not offer doppler capability and image definition is not as good as phased array ICE. Radial ICE’s 360° scan has a larger field of view and allows for a more comprehensive depiction (compared to phased array) of both atrial chambers and atrioventricular valves with their relationships and it also can be used as intravascular ultrasound for great vessels. Phased-array 8 French, 4.5–11.5 MHz catheter (AcuNavTM Ultrasound Catheter, Biosense Webster Inc., Diamond Bar, CA) has a 90° sector image, Doppler capability, and is deflectable. Radial ICE’s mechanical transducer is a non-deflectable catheter thus a steerable sheath (Zurpaz 8.5F Steerable Sheath, Boston Scientific Corporation, Natick, MA or Agilis, St. Jude Medical, St. Paul, MN) is required for precise catheter movements beyond transseptal puncture guidance. 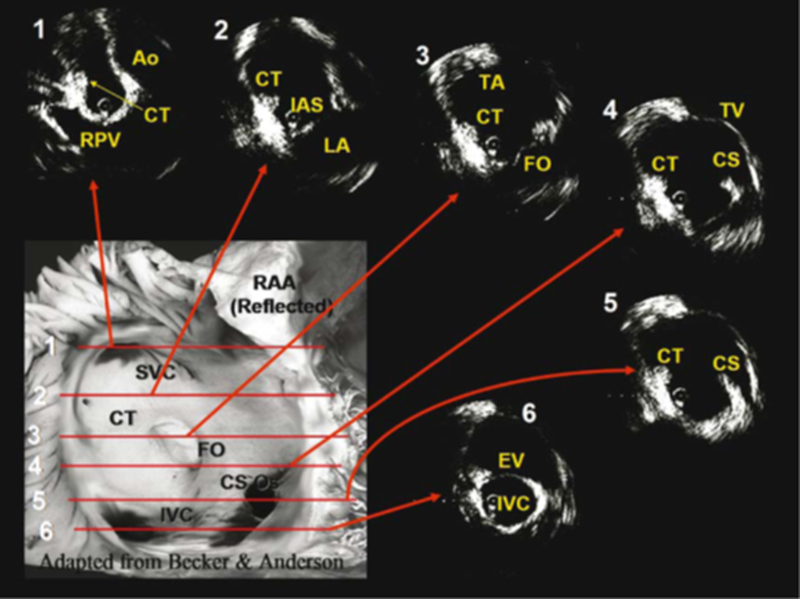 Figure 1 depicts the basic cardiac anatomy revealed with radial ICE and the analogous fluoroscopic views. The high SVC view permits view of the SVC and ascending aorta and the PA comes into view as one moves inferiorly towards the low SVC. The mid RA view tends to be the most useful view for orienting oneself in the right heart and (as discussed later) is the most useful view for transseptal access into the left atrium. 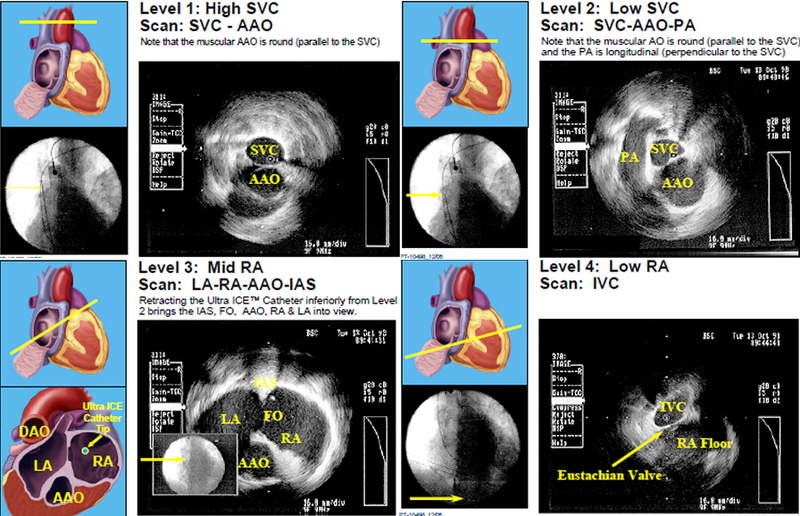 The low RA view is useful for delineating complex IVC and CS anatomy. Figure 1 Basic Cardiac Anatomy with Radial Intracardiac Echocardiography (ICE). Figure 1 Basic Cardiac Anatomy with Radial Intracardiac Echocardiography (ICE). The basic radial ICE anatomy is depicted starting superiorly in the high SVC (Level 1), low SVC (Level 2), mid RA (Level 3), and low RA (Level 4). © 2013 Boston Scientific Corporation or its affiliates. All rights reserved. Used with permission of Boston Scientific Corporation. AV Node Reentrant Tachycardia requires careful catheter manipulation to modify the slow AV node pathway. Traditionally, slow AV node pathway modification is guided by fluoroscopic images and electrogram morphology. Radial ICE-guided AVNRT ablation has been well-described by Fisher et al. 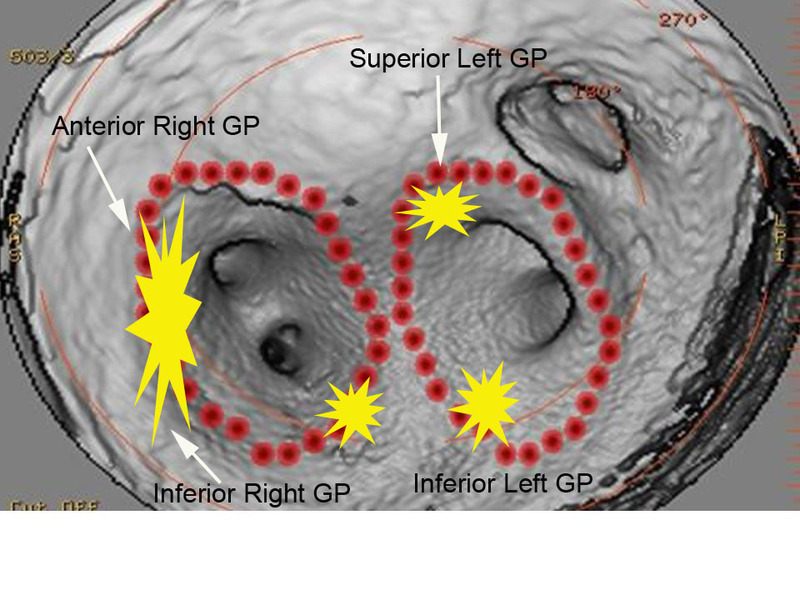 Figure 2 depicts the radial ICE anatomy of the slow AVN pathway during an ablation for AVNRT. In this case, the patient had a persistent left superior vena cava (SVC) and ablation at attractive electrograms using fluoroscopic guidance did not yield a successful ablation. Figure 2 Radial ICE Guidance during AVNRT Ablation of the Slow AV Node Pathway. Figure 2 Radial ICE Guidance during AVNRT Ablation of the Slow AV Node Pathway. 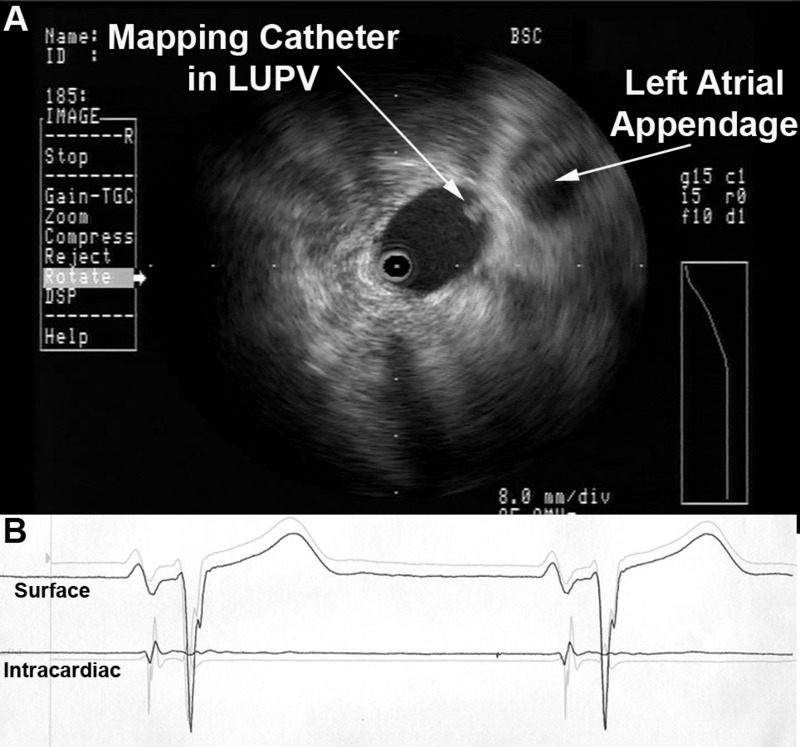 The left image depicts initial ablation catheter not in contact with the endocardial location of slow AVN pathway. The right image clearly depicts adequate electrode-endocardial contact which resulted in a successful ablation. 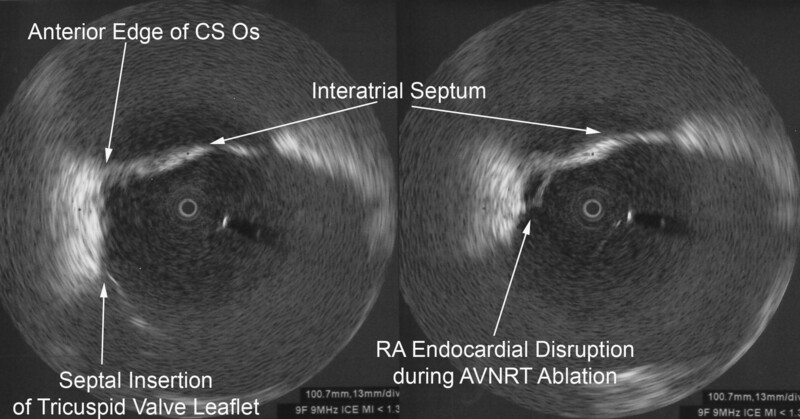 Radial ICE imaging was then used (with ICE catheter directional guidance via steerable sheath) to anatomically guide the ablation electrode to the slow AVN pathway which is located in the region at the anterior edge of the CS os near the septal insertion of the tricuspid valve leaflet (e.g., the anterior border of triangle of Koch). The left image shows the initial ablation catheter position and clearly demonstrates the electrode is not in contact with the endocardium. 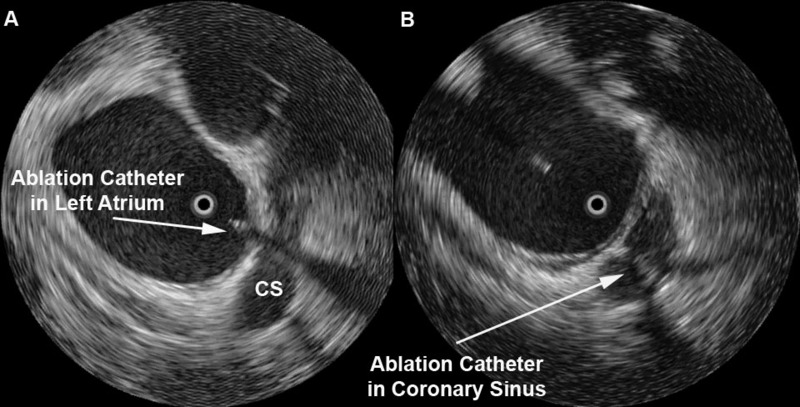 Ablation catheter manipulation to the location depicted in the right image led to an immediately successful ablation. Radial ICE guidance during AVNRT ablations allows one to visualize and ensure catheter stability during the ablation to avoid accidental catheter migration as compared to fluoroscopy which does not permit one to constantly monitor the electrode-endocardial interface. AV Node Ablation can generally be performed under RAO and LAO fluoroscopic guidance however, there are times when the compact AV node cannot be ablated using traditional right atrial ablation techniques or only right bundle branch block can be obtained. Radial ICE can be used to complete AV node ablation by catheter guidance to the leftward extension of the His purkinje system prior to attempting a retrograde aortic approach to AV node ablation (which often requires an 8 French right femoral arterial sheath). Figure 3 depicts a typical site where complete heart block can be obtained by ablating more proximate to the leftward extension of the His bundle. Figure 3 Completion of AV Nodal Ablation under Radial ICE Guidance. 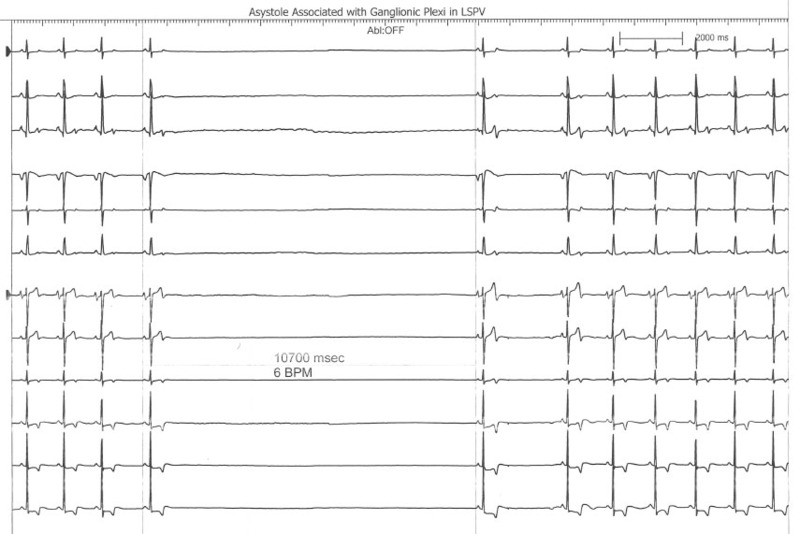 Figure 3 Completion of AV Nodal Ablation under Radial ICE Guidance. 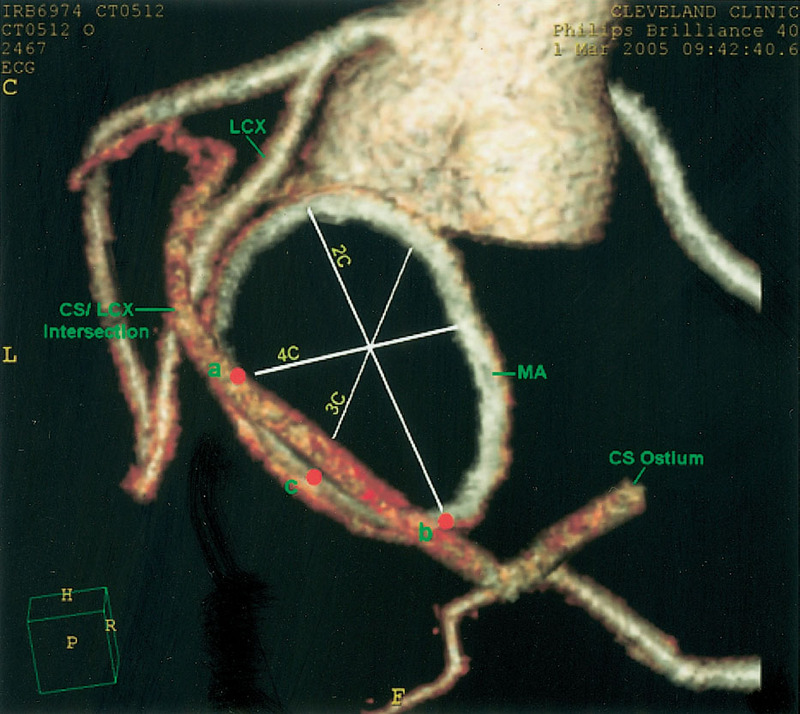 This figure depicts radial ICE catheter location in the RVOT near the level of aortic valve. The radial ICE allows catheter position nearer to the leftward extension of the His purkinje system in an attempt to complete AV node ablation. Radial ICE can be used for detailed assessment of RA anatomy especially during mapping of difficult atrial tachycardias. Figure 4 shows the level of RA detail radial ICE can provide to assist EP study catheter localization. Figure 4 Radial ICE Assessment of RA Anatomy. Right atrial anatomy is nicely visualized with radial ICE and corresponding anatomic specimen. 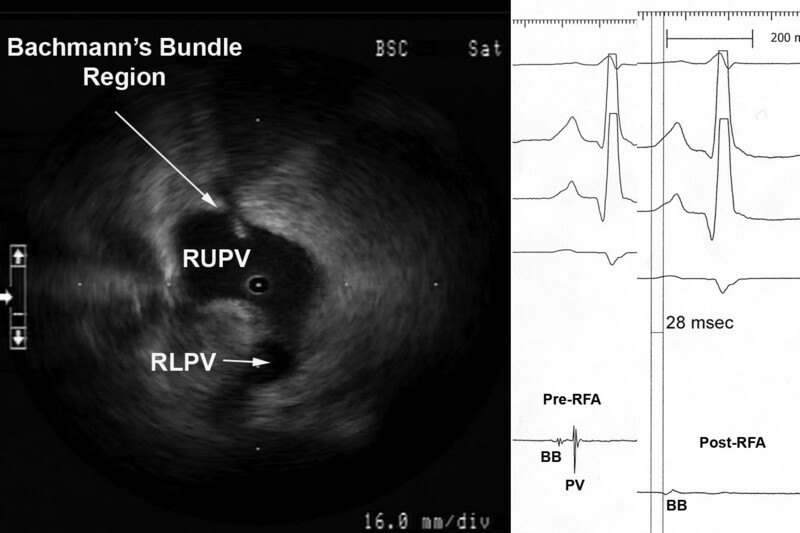 One can see how adjunctive imaging during difficult RA ablation may help visualize catheter position and endocardial contact. Figure taken from Springer, Journal of Interventional Cardiac Electrophysiology . Oftentimes, catheter access of the CS can be difficult due to anatomic variants involving both the Eustachian ridge (when using femoral venous access) and Thebesian valves. The Eustachian valve continues superiorly from the IVC as the Tendon of Todaro that forms the Eustachian ridge (forming the superior aspect of the triangle of Koch). Additionally, prior reviews of CS anatomy (4) revealed the presence of Thebesian valves (rudimentary valve covering CS os) in 80% of cases. It covered one-fifth in 7%, one-third the os in 29%, one-half in 27%, two-thirds in 14%, and the entire os in 5%. Figure 5 depicts radial ICE imaging of both anatomic variants. A minimally fenestrated Thebesian valve can make CS access unfeasible as in this case. A prominent Eustachian ridge can mandate CS access using a subclavian or jugular venous approach as it often impedes catheter placement when using a femoral venous approach. Figure 5 Radial ICE Imaging of CS Anatomic Variants. Figure 5 Radial ICE Imaging of CS Anatomic Variants. 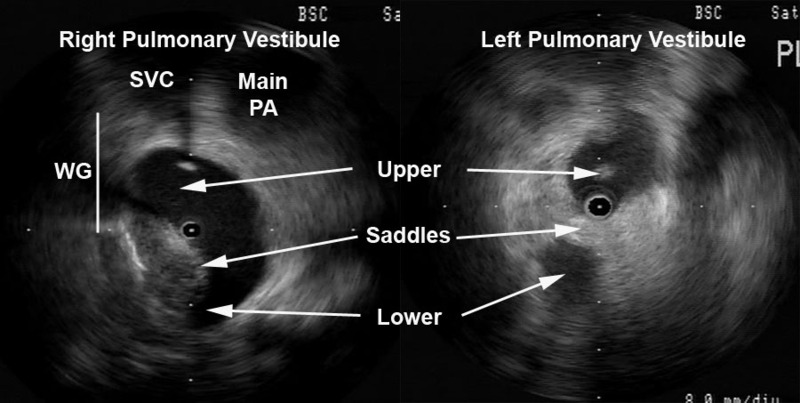 The left image shows a Thebesian valve with no obvious fenestrations covering the CS os. The right image shows a prominent Eustachian ridge extending from the IVC and overlying the superior aspect of the CS os. 1 Fisher WG, Pelini MA, Bacon ME, “Adjunctive Intracardiac Echocardiography to Guide Slow Pathway Ablation in Human Atrioventricular Nodal Reentrant Tachycardia: Anatomic Insights,” Circulation, V. 96 (1997), pp. 3021-3029. 2 Morton JB and Kalman JM, “Intracardiac Echocardiographic Anatomy for the Interventional Electrophysiologist,” J Int Cardiac Electrophysiology, V. 13 (2005), pp. 11-16. 3 Ho SY and Ernst S, Anatomy for Cardiac Electrophysiologists (2012; Cardiotext Publishing, LLV, Minneapolis, MN). 4 Pejkovic B, Krajnc I, Anderhuber F, Kosutic D, “Anatomical Variations of the Coronary Sinus Ostium Area of the Human Heart,” J Int Med Research, V. 36 (2008), pp. 314-321. This is an interesting finding observed during a recent atrial fibrillation ablation performed in our Heart Rhythm Center. The ablation paradigm has been previously described  and consists of a pulmonary venous antrum isolation using entrance and exit block criteria guided by intra left atrial radial intracardiac echocardiography (ICE). During the initial antrum encircling lesion asystole developed (see following figure), ablation was stopped, and sinus rhythm recovered within 10seconds. 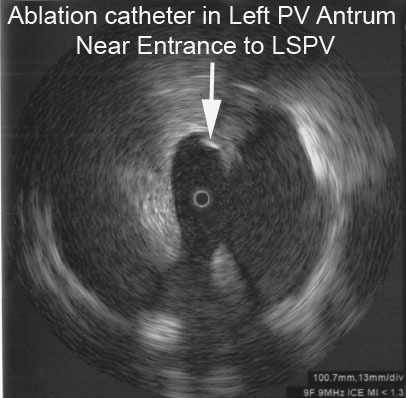 The following radial ICE image demonstrates the ablation catheter location in the superior aspect of the left pulmonary venous antrum near the left atrial appendage. Bradycardia is often seen during atrial fibrillation ablations when proximate to autonomic ganglionic plexi. I routinely see fluctuations in basal sinus rate during pulmonary venous antrum ablations but this was more dramatic than the sinus rate changes I usually observe. This location as seen on the intra left atrial radial ICE shot is slightly more anterior than the left superior ganglionic plexus is usually expected. The following figure shows a CT reconstruction of the posterior left atrium and pulmonary venous antra. The red dots depict a typical venous antrum ablation lesion set and the yellow areas denote the approximate locations of the ganglionic plexi. Discontinuation of ablation led to quick restoration of sinus rhythm and repeat ablation near this location to finalize lesion set did not result in repeat asystole or significant fluctuations in sinus rate. Another possible explanation for this finding is acute sinus node dysfunction (from damage to the sinus node artery, SNA) during ablation in the anterior left atrium. Chugh et al present an excellent review of coronary arterial injury during ablation of atrial fibrillation. Though there was no obvious PR prolongation prior to the pause suggesting an autonomic effect, there was also no obvious sinus tachycardia or acceleration serving as a “harbinger of impending [sinus node] dysfunction.” Though the SNA arises from the RCA in two-thirds of patients, the remainder of SNA arise from an early branch of the circumflex which “passes superiorly and to the right of the LAA and courses over the anterior LA before terminating at the cavoatrial junction.” Less commonly, the SNA branches off a more distal portion of the circumflex and ascends in the lateral ridge between the appendage and the left pulmonary veins. The patient had an uneventful post-ablation recovery. 1 Schwartzman D, Williams JL, “On the Electroanatomic Properties of Pulmonary Vein Antral Regions Enclosed by Encircling Ablation Lesions,” Europace , V. 11 (2009), pp. 435–444. 2 Pappone C, et al “Pulmonary vein denervation enhances long-term benefit after circumferential ablation for paroxysmal atrial fibrillation,” Circulation, V. 109 (2004), p. 327. 3 Katritsis DG et al, “Autonomic Denervation Added to Pulmonary Vein Isolation for Paroxysmal Atrial Fibrillation A Randomized Clinical Trial,” JACC, V. 62 (December 2013), pp. 2318–25. 4 Chugh A et al, “Manifestations of coronary arterial injury during catheter ablation of atrial fibrillation and related arrhythmias,” Heart Rhythm, V. 10, No. 11 (November 2013), pp. 1638-1645.